Update 1.83 "Masters of the Sea"
Update 1.83 "Masters of the Sea" (changelog) was introduced on 23 October 2018. The update is notable for bringing both ships and helicopters into OBT, allowing all players to research and play them. 2.12 Changes specific to the PlayStation®4 platform. 2.13 Changes specific to the Xbox One platform. U.S, Soviet and German helicopters are now available for research. New naval location “Black Sea port”. Increased detalization of the naval location “Green mountains gulf”. Full rework of roads and bridges on the following aircraft battles locations locations: Khalkhin Gol, Ardennes, Korsun. Now bridges correctly coincide with the roadway. They now have "embankments" and bridges are much better combined with the landscape. The structure of roads and routes of AI ground vehicles has been corrected: crossroads have been added, new route points and new roads and routes needed for the missions have been added. Naval missions are now available in custom battles. SU-5-1, M4A1 (76)W, M4A2 (76)W, Flakpanzer I Gepard — The order of ammunition usage has been refined. For cannons of calibres between 40 and 57 mm — 10 degrees per second. Flakpanzer 341 — The name of the Flakpanzer V “Coelian” has been corrected. Sources: Panzer Tracts No.20-2 Paper Panzers - Aufklarungs-, Beobachtungs-, and Flak-Panzer (Reconnaissance, Observation, and Anti-Aircraft). Marder III H - The values of the angles for elevation and traverse have been specified. Elevation: was -2/+22, is now -9/+9. Traverse: was -30/+30, is now -28/+28. M247 — a bug where no lead marker was displayed whilst firing at aircraft has been fixed. “Hull-break” effect bug of the chassis has been fixed. Centurion Mk.I - Engine power has been changed from 600 to 635 horsepower. The mass of the vehicle has been changed from 48,7 to 46,9 tons. Maximum speed has been changed from 35 to 37 km/h. Source: WO 291_1439 Vol 1 British tanks. M1 Abrams - The durability of the frontal hull part has been changed from 378 to 355 mm. Source: Stridsfordonidag och imorgon Ett föredrag om Svenskt Pansar med utgängspunkt і historien Arsenalen den 8 november 2012 av Rickard О. Lindström. M47 // mKPz M47 G - The magnification of the sight has been changed from the variable value 6-7,5х to fixed value 7,5х. Source: E﻿NGINEERING DESIGN HANDBOOK - FIRE CONTROL SERIES - SECTION 1 FIRE CONTROL﻿﻿ SYSTEMS - GENE﻿RAL﻿﻿ HEADQUARTERS, U.S. ARMY ﻿MATERIEL C﻿OMMAND﻿ JANUARY 1968﻿﻿ // DEPARTMENT OF THE ARMY TECHNICAL MANUAL TM 9-718A 90-mm GUN TAN﻿K M47 DEPARTMENT OF THE ARMY JANUARY 1952. Leopard 2K - The magnification of the sight has been changed from 8-12х to 8-16х. Source: Carl Zeiss Archive. IS-2 —a bug when you could separately control coaxial MG has been fixed. New type of explosive material “Smoke-forming composition” has been added to the smoke shells. This type of the explosive substance has been used for all smoke shells and replaced the “TNT” used previously. 120mm DM13 — Round mass has been increased from 3 to 4.4 kg. Source: FT 120-D-2 Firing Tables Cannon, 120mm Gun, M256. April 1994. 100/115mm 9М117 — max ATGM controllable distance has been increased from 4 to 5 km. Source: МО СССР. Выстрел 3УБК10 с управляемым снарядом 9М117. Техническое описание и инструкция по эксплуатации. 30mm APDS (30mm HSS 831L/A, L21A1) - The type of shell has been changed from APCR to APDS. The penetration of the shell at meeting angles other than normal has been increased. 18 inch Mk. XV Torpedo mass is now correctly displayed in the info card. S.M.79 series 4 - injection modification has been removed. PBY-5 - engine display in x-ray view has been fixed, and number of engine cylinders is now displayed correctly. Oblique flow calculation effect has been added for helicopter rotors (more accurate flight behaviour at different speeds). Ground effect performance has been changed (esp. noticeable during take-off and landing). Bf 109 E-4, 7 — automated control of the radiator doors have been changed to manual in full control mode. Ju-288c - tuned according to the data sheet. M.B.175T - tuned according to the data sheet. Multiple vessels now have side and bow mounted bomb launchers as modifications. They can be launched by pressing the “R’ key in the direction of the camera view. New armour types have been added. Now naval vessels have bullet-proof, fragmentation-proof, rolled or cast homogeneous armour depending on the vessel. The fragmentation effect has been reworked. Spread and damage have become more realistic. Depending on the ammo weight and shard type, the resulting fragmentation may be different in weight, number and total damage. All shards spread according to diagram for a “damage sector”. Additionally, one round may produce shards that vary in their weight and penetration power. Artillery, upper structures, torpedo launchers and other deck-based components are now more vulnerable to explosions, shards and direct hits. Any unarmoured upper structures can be damaged so they won’t function even with MG fire. Internal modules may also be damaged by explosions, kinetic damage, shards and fire in different situations. Thus boiler compartments are more vulnerable to direct hits and shard damage, unlike controls that are much more vulnerable to explosions. Engines situated in drowned compartments as well as transmission and ammunition rooms will be damaged or become unavailable until the water is pumped out of that section. Fragmentation-proof blankets or screens whilst whole will prevent shards from penetrating dependant on the blankets thickness and the damage power of the fragments. Survivability and resistance towards different types of damage have been reworked for the sections occupied by the crew; an explosion or dense fragmentation will inflict much greater damage than a single AP round that penetrates through a vessel without internal fragmentation. Larger vessels can survive a hit by a light torpedo (SET-40 for example), however they still suffer severe damage. The crew has been moved to the upper deck and artillery deck. Upper deck structure is now protected with 10mm rolled armour that contains most of the crew, however the control cabin remains unprotected. All MGs and autocannons up to 20mm now have stabilization by using of the gunner's shoulder rest. Correct radio cabin dimensions have been added for all vessels. The crew is placed depending on the vessel type and historical data. A new criteria for vessel destruction has been added. When massive damage from an explosion is received (it depends on the vessel size and class) they may still be destroyed even if their total crew value is not lower than required minimum standard to class the ship as previously inoperable. MBK 161 mod.1944 Soviet armoured boat has received its historical camo. The German LS class reserve torpedo boat has been renamed to LS 3. The maximum speed of the German K-2 Kanonenboot has been changed from 30 to 18.6 knots according to historical information. Looping torpedoes around the same area by launching during a sharp turn has been fixed. The appearance of fuel tanks in X-Ray view has been visually improved and is now the same for all ships. Support for a new type of texture compression (incompatible with game version 1.81 and older) has been added). Achievements for naval vessels have been added. Battle tasks for naval vessels have been added. The purchase cost in Silver Lions of the pr.159 Soviet vessel has been significantly reduced. New 3d decorations “helmets” (both armour and infantry) have been added for various nations. Old 3d decorations have been moved to the respective section. New camo has been added for F4F-3 and F4F-4. New camos have been added for Т-80B. New camo has been added for BMP-2. Naval vessel control tips have been added to the loading menu. A bug that caused the third-person camera view to reverse has been fixed. A bug where the camera focused on the rear end of a naval vessel at the start of a battle has been fixed. It is now possible to capture points in Naval battles with hydroplanes/seaplanes. Changes specific to the PlayStation®4 platform. Changes specific to the Xbox One platform. Pre-release of Xbox One is over. The game is now available for everyone with an Xbox One. Xbox players are now able to add PC players as friend, can squad and join game with them. Sounds for new helicopters have been added. Small changes to optimize the usage of the sound game resources. Fixed a bug removing sections of the Т32Е1 armor. Camouflage for the BMP-2 has been added. Spalling effect has been optimized in x-ray view mode for naval battles. Previously an HE hit caused FPS reduction. USA from 2 to 5. Germany from 2 to 5. USSR from 2 to 3. 23016 → 16008 SL in simulator battles. 17904 → 14632 SL in simulator battles. Research point rewards have been decreased by 20% in SB air battles (excluding Enduring Confrontation mode), in order to match average RP income in other game modes. A bug that could cause a client crash when a vessel was destroyed in naval battles has been fixed. A bug when there was no option to choose a joystick axis displayed in controls menu has been fixed. Console players (PS4 and Xbox One) are now able to trade items received from the “Valkyrie I” trophy in the Workshop. The penalty for missing the daily login required for daily rewards has been reactivated (it was temporarily paused after the release of update 1.83). A bug which would cause the vertical reticules in aiming sights to be displayed thinner in 4k mode than in other resolutions has been fixed. In Naval Realistic Battles, the score earned in a battle has been increased. It will lead, on average to a 10% increase in battle activity following the results of the battle. The amount of Respawn Score at the start of the battle has been changed from 3000 to 450. The amount of Respawn Score required to select any aircraft has been changed from 3600 to 650. The amount of Respawn Score required for a secondary fly out with an aircraft of the same type (fighter or attacker/bomber) has been changed from 3600 to 1300. The Respawn Score earned for actions in a battle has been reduced by half in Arcade Battles and by 1.7 times in Realistic Battles. Crew has been removed from the ships radio position, located inside the ship’s hull as the ship was not sunk previously when it was completely destroyed (black) where the crew manning the ship’s radio located in the superstructure remained. Survivability of pumps, ships engines and rudder/s have been reduced. Now they are easier to damage with explosion or secondary fragments. The radius of operation of radio fuses has been increased in accordance with their specifications. MPK pr.122a — The traverse speed of the main calibre turret has been fixed. SKR Pr.159 — A bug where target capture did not occur in Realistic Battles has been fixed. MTB-1 1st series — The amount of ammunition has been doubled. Pr. 206 GDR— Displacement value in the ship card has been fixed. Pr. 206, Pr. 206 GDR — Extra modification “Low calibre machine guns” has been deleted. Experience required for the research of this modification has been returned. The hull material of the Schnellboats has been changed from structural steel to wood. The shooting of the side depth charge launcher on the Fletcher has been fixed. In “Assault Ground Battles arcade” mode at Battle Rating 8.3+, the vehicle line-up given to the players in aircraft strikes has been changed: for 8 destroyed enemies you will be able to choose helicopters with ATGMs (instead of bombers), for 3 - a helicopter with unguided rockets (instead of an attacker) and for 2 - a fighter (as before). A bug, where the SA.313B Alouette helicopter had only one respawn in ground and helicopter battles instead of two, has been fixed. The algorithm of the default modification selection has been changed. Ground vehicles, by default, now have “parts” and “FPE” as a priority. Destroyers and cruisers, now have the tool set and fire protection system by default. All other vessels, the seakeeping and unsinkability modification group will now be by default. This means if you, for example, purchase a tank, the “parts” modification will be chosen automatically for research. This reduced cost will be active for 4 months, until the 1st of March 2019. These changes are not final and may be amended in the future. The final decision as to these costs will be made after the end of this trial. A bug which would cause the vertical reticules in aiming sights for vessels to be displayed thinner in 4k mode than in other resolutions has been fixed. A bug where players could not repair their ground vehicles at a captured zone without having the ”parts” modification has been fixed. 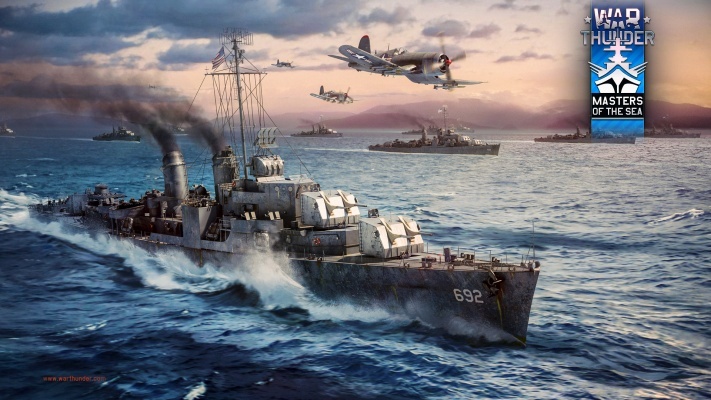 A bug where free repairs could not be used in naval battles has been fixed. A bug with reward calculation in Naval Battles, where rewards for damaging targets were distributed incorrectly among attackers, has been fixed. Light cruisers now have the option to use a destroyers’ respawn point. Aircraft spawn altitudes have been corrected. Medium and heavy bombers will now be moved to “Bombers” spawn point. A bug when in the “38th parallel” mission, the central capture point initially belonged to one of the teams has been fixed. Elevation animation for the Tragflügel-Versuchs-Schnellboot VS-10 MGs has been corrected. 7.72 mm Lewis 1916 machine gun visual firing effect has been updated. Visual effects for the following bombs and rockets have been corrected: RBU-2500 mortar, 114 mm M8 rocket, 82 mm M-8 rocket, 127 mm Mk.7 rocket, 170 mm BM-14-17 rocket launcher. Sight angles for 3 pdr QF Hotchkiss cannon (Fairmile B (ML345)) have been increased. Sight angles for 40 mm Bofors Mk. I mounting (Brave class (P1011)) have been increased. Sight angles for 12.7 mm DShK (Ya-5M) have been increased. Weapon groups for SGB Grey Fox (S304) have been changed. Weapon groups for Landing Craft Support (Large) (Mark 3) have been changed. Centre of mass position for Kanonenboot K-2 has been changed, heeling during turning is reduced. Centre of mass position for Ya-5M has been changed, heeling during turning is reduced. Tracer for the 76mm shell with radio fuses (ЗС63, Mk.31, DM 261) has been added. The ballistic range for the OF62 shell has been increased from 10 to 15km. OS2U-1 and OS2U-3 aircraft are now available for research and purchase. By researching the 2nd rank in the US naval tree, the OS2U-1 will be given out automatically and the OS2U-3 will be available for research and purchase. A quick link to the Warbond Shop was added to the “Shop” menu in the hangar. A MacOS 10.14 bug where a wrong resolution was applied has been fixed. Changes has been made to the naval research trees of Germany and the USSR in order to equalize the speed of player progression and to ensure equal research speed conditions for destroyers. S-100 (1944) - has been moved to the right of the S-100 (1945), and it now unlocks the ability to research the SF40. The VS-10 has taken its place in the tree. The SF40 is no longer required to unlock the AF D1. Thus in order to unlock rank 3 for Germany, a player has to research both the S-100 (1945) and the VS-10. The Pr. 1204 Late has now been moved below the Pr. 1124 (1940). It now unlocks research for rank 3 vessels. The Pr. 1204 Late is now required to research the Pr. 183 which has been shifted to the right on the research tree. Frunze, 1940 ("Schastlivy" type) has exchanged places with the Pr. 159 in the research tree. Räumboot R-301 from 2.0 to 2.3 (all game modes). Klasse 140/141 (Jaguar) from 3.3 to 3.7 (all game modes). Frunze, 1940 ("Schastlivy" type) from 4.0 to 3.7 (all game modes). SKR Pr. 159 from 3.7 to 4.0 (all game modes). MBK Pr.186 (MK 85) from 3.3 to 3.0 (all game modes). MBK Pr.186 from 2.7 to 3.0 (all game modes). Fairmile C (312) from 3.0 to 2.7 (all game modes). Landing Craft Support (Large) (Mark 3) from 3.3 to 3.7 (all game modes). In the controls menu for each vehicle type, buttons that swap the gamepad’s left stick axis to the right, and vice versa, have been added. Mines active time duration has been increased from 2 to 4 minutes. A problem when launching game on laptops with an integrated AMD graphic card has been fixed. A disabled engine blocks vehicle movement completely for 20 seconds, after which it is restored to 40% of its original power. A disabled transmission blocks vehicle movement completely for 20 seconds, then the range of gear change is reduced by two. This type of fast field repair does not require the “parts” modification. MPK-163 — a bug where the mortar became available after unlocking depth charges has been fixed. A bug where bombs were not being displayed in X-Ray view has been fixed. Cowell (DD-547) — A bug when firing the main calibre gun caused depth charges to also drop has been fixed. S-38b — A bug where torpedoes were still displayed in X-Ray view after they had been launched has been fixed. Pr. 206 — auxiliary targeting armament modification has been removed (not required). German Pr 206 displacement value in the info card has been corrected. Pr.191 — Max. speed and displacement values in the info card have been corrected. LS 4 — two extra respawns have been removed. Pr. 159 — mortar magazine is no longer displayed in X-Ray view if mortar has not been researched, depth charges are disabled. Visual effects for rounds hitting water have been improved; the main calibre gun turrets rotation speed with installed mortars has been corrected. AF D1 and AF D3 — researchable 37mm rounds for the auxiliary targeting armament have been removed. 20mm ammo belts for the AA have been added instead. AF D3 — all 20mm Flak guns have been moved to AA group. S-100 Lang, S-100 (1945), S-204 — 20mm autocannon modifications ammo belts reload has been unified. Changed to 1200 shots per barrel. A bug where only half of the magazine was being loaded has been fixed. KMS Emden, Type 1939 — turret armour thickness values in the info card have been corrected. Fairmile D (697), Fairmile D (5001) — deflection angles on the 57mm guns have been increased. Pr.1124 (1940), Pr.1124 Rocket version, Pr.1124 (1945), Type 143 — camera position has been changed. Type 140/141 — torpedo side launch has been corrected. Asheville (PGM-84) — main calibre gun overheat has been added; reload time has been reduced from 15 to 10 secs. API-T rounds have been added to the Vickers Mk.V 12.7mm MG. Smoke trails for all naval MGs and autocannons of calibres 7 to 40mm have been removed. Overheat has been added for 30mm, 57mm, 76mm naval autocannons. Overheat has been removed for all naval MGs up to 20mm calibre. Chance of destruction for larger ships with one hit has been decreased. Oil tank detonation for larger ships has been removed. Each calibre now has a preset of dispersion diagram and shard penetration value. HE, AP and shrapnel rounds have different diagrams for shard dispersion. Sheets for armour penetration and kinetic damage of HE shells have been corrected. The damaging effect of HE and AP shells of medium and large calibre (57-180 mm) has been reworked. Now, with increasing calibre, the damage effect will also increase correctly and shells of different calibres are more significantly different from each other. The striking ability of shells of large calibers (150-180 mm) is now much higher. A system which allows you to keep track of the rounds that you have fired has been added. It is often difficult to distinguish between water splashes caused by different rounds, especially at large distances. So in arcade naval battles, we have added a system which highlights (in green) the round, part of its trajectory, and where it falls. This highlighting begins to work when shooting at distances of 3.5 km or more while using guns of at least 100 mm calibre. These parameters are not final and may be changed. You can turn this option on in the controls menu. Ship → Weaponry → show projectiles trajectory. The mechanics of aircraft usage in naval battles has been changed. Now, it is not possible to use aircraft with a BR higher than 0.6 of the maximum ship BR in one’s lineup. Additionally, prohibited aircraft will not be taken into account for matchmaking. By way of example, a player with the a setup such as this: “Ship BR 2.7; ship BR 3.0: aircraft BR 3.0; aircraft BR 3.7” will join a battle with a BR between 2.0 and 4.0 and will not be able to use aircraft with BR 3.7. A bug discarding the gamepad “cursor speed” setting value after every game launch has been fixed. A bug affecting performance during camera movement in the hangar on the consoles has been fixed. A new mission type, “battle”, has been added for Naval battles. See details in the dedicated forum topic. A single time popup in the hangar screen, which recommends that players try vehicles and game modes they haven’t played yet, has been added. Battle rating changes for aircraft and ground vehicles has been implemented. Naval tutorial has been added. A bug in the “boat control basics tutorial”, where a vessel would delay initiating the stop action when requested, has been fixed. A bug where the time delay to escape battle was lengthy on weaker PC configurations has been fixed. A bug where the icon for ammunition refilling didn’t disappear when joining air strike in ground vehicles AB has been fixed. A bug where in some cases the model of the aircraft wasn’t displayed in air strike for ground vehicles AB has been fixed. A bug where in Naval Battles after automatic reloading of alternative type of ammunition to depleted ammunition did not occur has been fixed. A bug where in VR headsets, the internal parts of players helicopter model was shown has been fixed. A bug where the ground vehicle turret with stabilizer was turning faster than normal on opposite hull rotation has been fixed. Notification of selected game mode change by user when switching a vehicle preset or nation has been added. In the vehicle setup menu the information about the game mode which is connected to current vehicle preset has been added. A bug where changing the screen resolution would cause the area of movement of the mouse cursor to become limited has been fixed. A bug while following a bomb where, in some rare cases, it would show the bomb outside the camera view, has been fixed. A bug where, at low screen resolutions, not all nations were visible in the service record screen has been fixed. A bug occuring when firing guided missiles from helicopters at long distances, where the position of ground vehicles in the client and on the server could vary, has been fixed. A bug occurring with some vehicles equipped with guided missiles in RB mode, where there was an ability, for some time, to control the missile with the mouse, has been fixed. A bug when playing ground vehicles, where inversion wouldn’t work when the mouse view mode was activated, has been fixed. A bug which would result in the flickering of the reload icon for first-order ammo racks has been fixed. A bug where it was possible to unlock the “Adamant” achievement when you were fired upon by allied vehicles in ground forces RB has been fixed. A bug which would occur during the repair of ground vehicles in a captured point, where the hint regarding the calling of allied units to assist in repairing your vehicle (intended for when you’re outside of an allied capture point) would be shown despite being repaired within a capture point at the same time, has been fixed. A bug during replays, where the “from the player” view wouldn’t always be shown correctly, has been fixed. An indicator which advises that crew viewing distances have been reduced because the tank’s commander was knocked out has been added for ground vehicles. The ability to restart a replay has been added to the replay menu. A bug occurring in ground RB battles. where the effect of directing a shot at a particular place on the client could differ from the direction of the shot on the server, has been fixed. The crew panel in the hangar has been updated. An icon displaying the selected torpedo launch mode has been added to the action panel for naval battles. An authorization button in the client through the Gaijin Single Sign On portal, as a single entry point for Gaijin products, has been added. Helicopter behaviour after a respawn has been corrected, as well as the bugs that caused damage to a vehicle. Calculation of ground effect has been improved. Surface topography influence on the air cushion and its distribution from the centre of the rotor to the end of a blade is made in a circular fashion. Transmission performance has been updated. Inertia and mass of the main and the anti torque rotors have been corrected. The characteristics of the rotors with blades anchored to the bushes on the main rotor hub (control and gyroscopic moments have been increased, angles of the equivalent flap of the main rotor have been reduced for BO-105, AH-1Z) have been updated. Gliding performance in auto-rotation has been corrected. A bug, when buildings that could not be penetrated by a round would still be penetrated through, has been fixed. A bug where the helicopter position on the client and on the server in some cases were different has been fixed. A bug when take off was sometimes impossible with specific aircraft in Simulator battles has been fixed. A bug where flap position did not change in the server replay has been fixed. This page was last edited on 23 February 2019, at 15:06.